Two days to report due to scanty internet connection and waning battery. The problem, or advantage depending on your point of view, with camping is that you are cut off from the normal comforts of home, principally the internet. Which brings me nicely to my current holiday reading – Zen and the Art lf Motorcycle Maintenance, a book which has spooky resonance with the current situation perhaps . . Anyway, back to the journey in hand. We left Locquirec behind and took the scenic route to our next campsite by the sea. This is fine up to a point but there is a limit to the amount of scenery one can digest before wanting to just get the **** there. One item of note is that S, from her customary position, mentioned my matching (unintentional) colour scheme with jersey and flag. 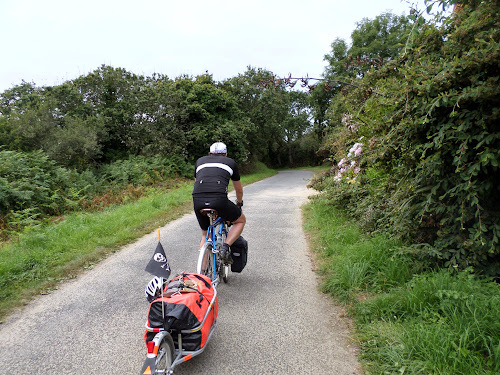 We have to thank Mike D for the flag, a focal point for any passing child if we happen to be parked up for le dejeuner – if you are under the age of ten and have a pirate flag on your bike, then you don’t just have a pirate flag, your are a pirate, off on some adventure, like Cap’n Jack. . . maybe S has a point, though I prefer the Flying Pig to the Black Pearl. So, we arrive at our current camping spot, right on the beach with the sun beating down and the sea winds wafting across the parched grass. I chose a spot right in the far corner of the campsite, sans electricité, for tpeace and quiet . . . but alas, who should we have next door but a family from ‘Benefits Street’, or at leat the French version of the franchise. Let me paint you a picture: as we return from last night’s diner at Le Creperie, the famile de benefits return with some ‘friends’ and continue their conversation past midnight. At this point S is soundly asleep due to a combination of earplugs and unusual somnobulent skill, but I have to endure until they seemingly all go to bed. 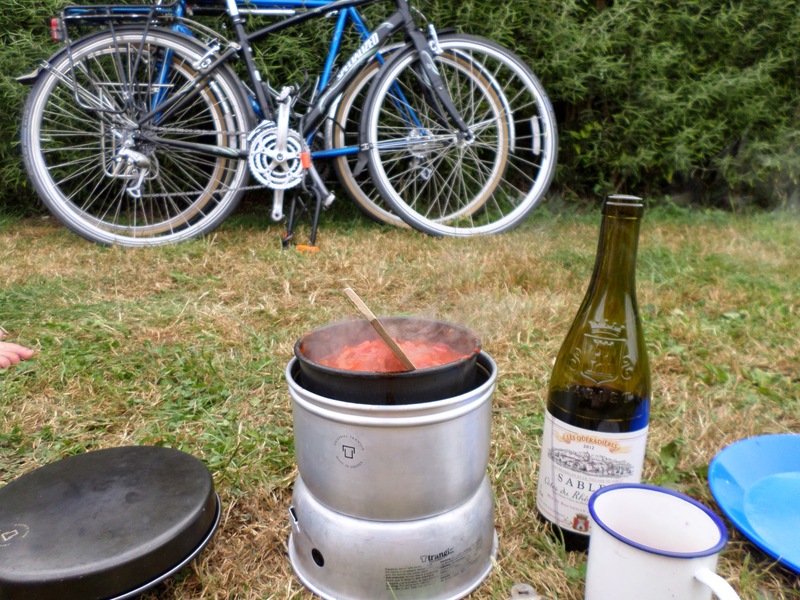 . . if only, because thence commences a snogging session amplified as only camping can, accompanied by the creak of shock absorber under repetitive strain. OK, all perfectly natural unless all you want is a good night’s kip . . ., but this is the weird thing, about 4 am in the morning when I awake (I would like to say for a run and dip in the sea but, in fact, to go to the toilet), andafter much faffing with the sleeping bag, zip, flip-flops, etc. . ., I emerge to find l’ami de monsieur benefits outside with a lady friend. What to make of it . . . S has censored me from some of my wilder speculations, so lets just say they popped out for a quick gitanes . . .